Oh. Hi. It’s me again. Me and those home-wrecking Oreo Thins. We have one more recipe to show you… if that’s okay? You might hate us for this one. Sorry. A couple of s’mores. 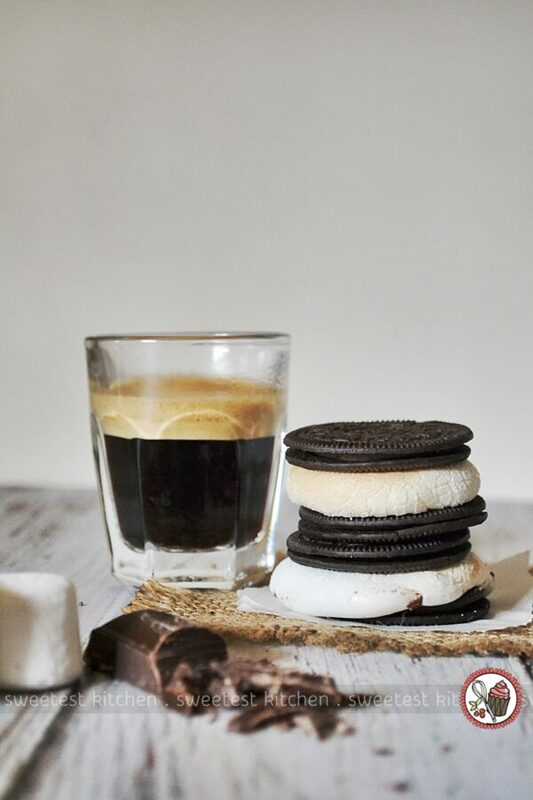 “Whoa,”, you say, “s’mores with Oreos??”. And I say, “Yep.”. Graham crackers? Pfft! You don’t need no graham crackers! Turn on your oven to preheat, 200C. Set out a small baking sheet, line it with a piece of baking paper. How many Oreo Thins s’mores would you like? Two? It’s okay, you can have two, because the serving size for Oreo Thins is larger; so you can have four Oreo Thins to every two normal Oreos. So, we cool? Okay. 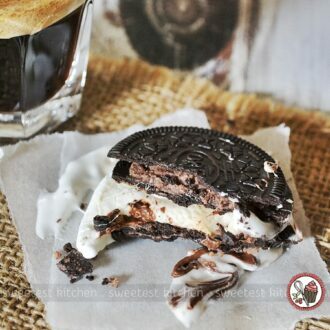 Place two Oreo Thins on the baking paper. Ooops, I think I used 3 for this photo. 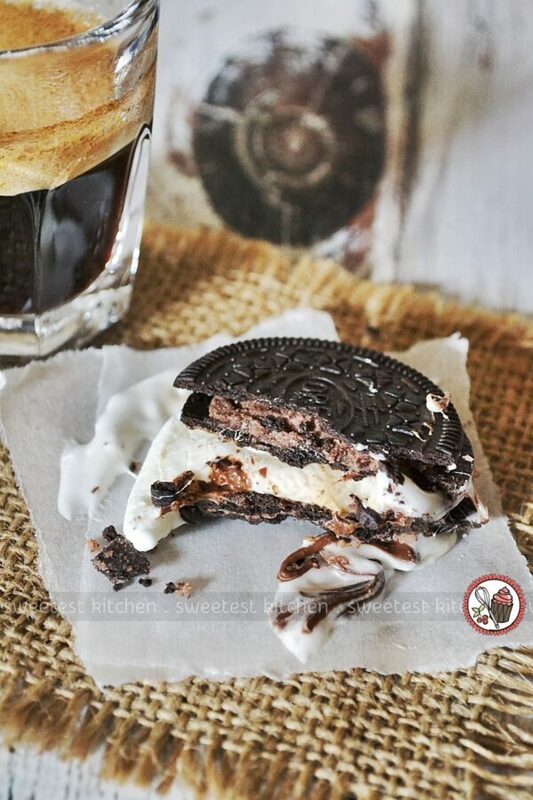 But anyway, finely chop up those pieces of chocolate and sprinkle them on top of the Oreo Thins cookies. Then place a marshmallow on top. Now, I’ve done the next step a couple of different ways. Because you need to have a cookie on top, too, of course. You can try to balance another cookie on top of the marshmallow, but usually, the cookie just slides off and the marshmallow oozes off the bottom cookie and it gets all messy. So, what I usually do now is just lie the top cookie by itself on the baking tray. Oh, if you want to be really naughty, sprinkle a little bit of chocolate on top of these cookies, as well. You know, because chocolate. Into the oven, top rack, about 3 minutes. Watch it closely. Those marshmallows will go all puffy and turn golden pretty quickly. Remove them from the oven – be careful, the s’mores will be very hot! The cookies will go a bit soft, too, but they’ll firm back up again. Let them cool for a couple minutes, then carefully top each puffy marshmallow with one of the warm, plain cookies. If you were one of the naughty ones who dressed up their top cookies with a scattering of chocolate, good on ya, more chocolate is more exciting, I say. Now that is one gooey, marshmallowy, chocolaty mess. It’s pretty gorgeous, don’t you think? You’ve got all the flavors of s’mores, minus the graham crackers, but plus all that chooooooocolate and the bonus addition of that wonderful tiramisu flavor. 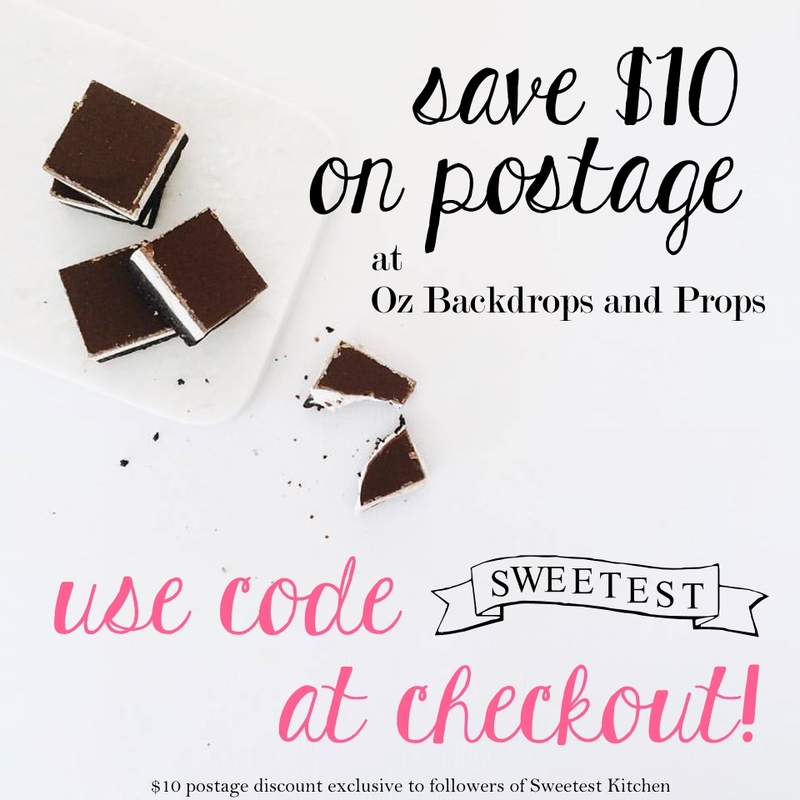 A quick and easy way to satisfy your sweet cravings any time of the day! 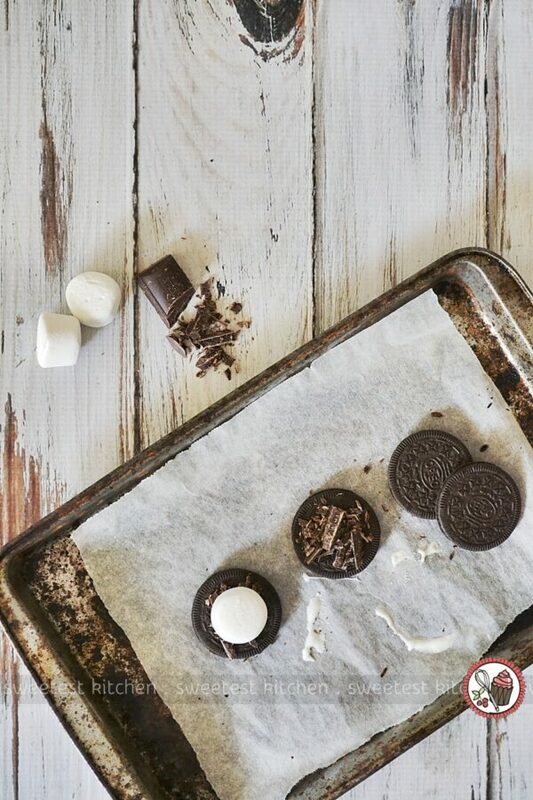 Warm, gooey Oreo s'mores made in your oven within minutes! Preheat oven to 200C (400F). Line a small baking tray with baking paper. 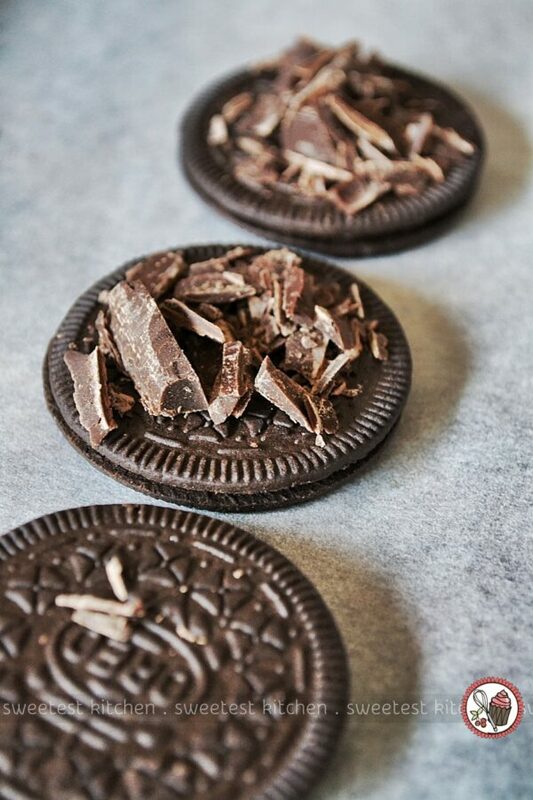 Place all 4 Oreo Thins on the lined baking tray. Leave 2 cookies plain, and sprinkle the chopped chocolate evenly on the 2 remaining cookies. Sit a marshmallow on top of the cookies with the chopped chocolate. If you feel like being naughty, chop a little extra chocolate and sprinkle it on top of the cookies you left plain. Hehe! When the oven is heated, place the tray on the top rack and bake for 2-4 minutes. Watch closely. 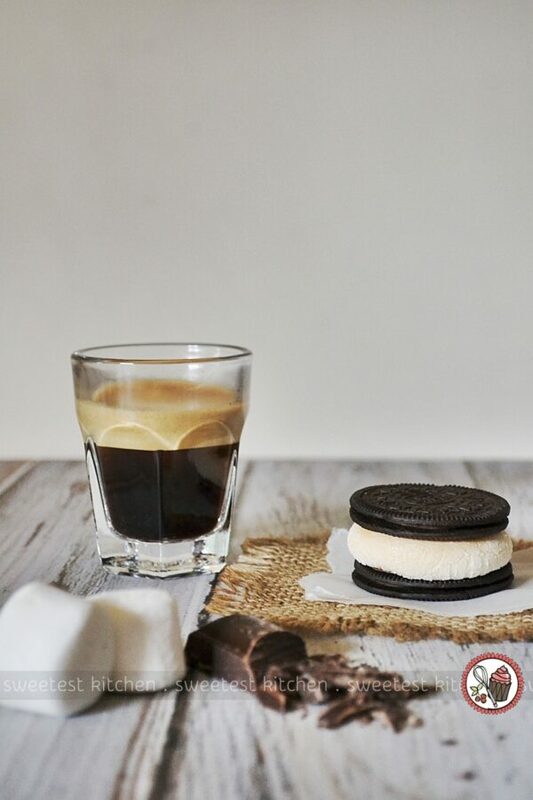 The marshmallows should go all puffy and a little bit golden, but you don't want to bake for too long, or the Oreo Thins will burn; shouldn't need any longer than 4 minutes. My magic time is about 3 minutes. Remove from the oven. Let set for a couple minutes to cool slightly. The Oreo Thins will be a bit soft, but they'll harden up again as they cool. 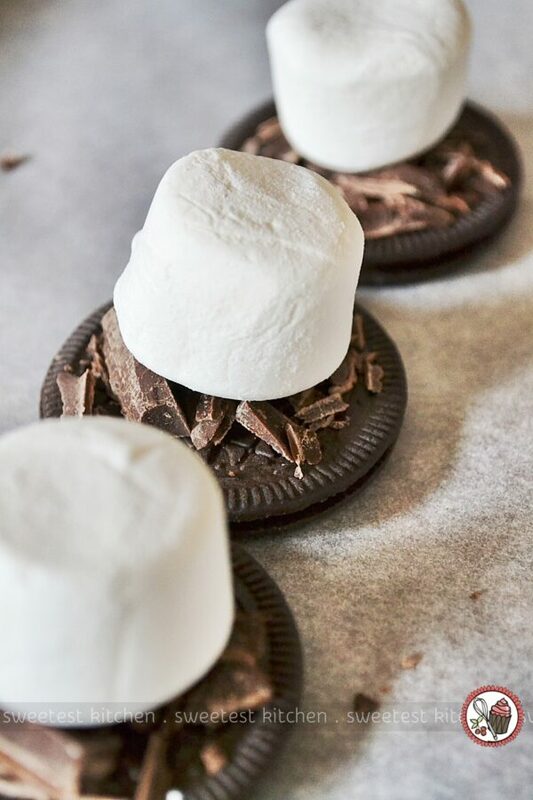 Carefully place a plain cookie on top of each of the marshmallows, and enjoy immediately! 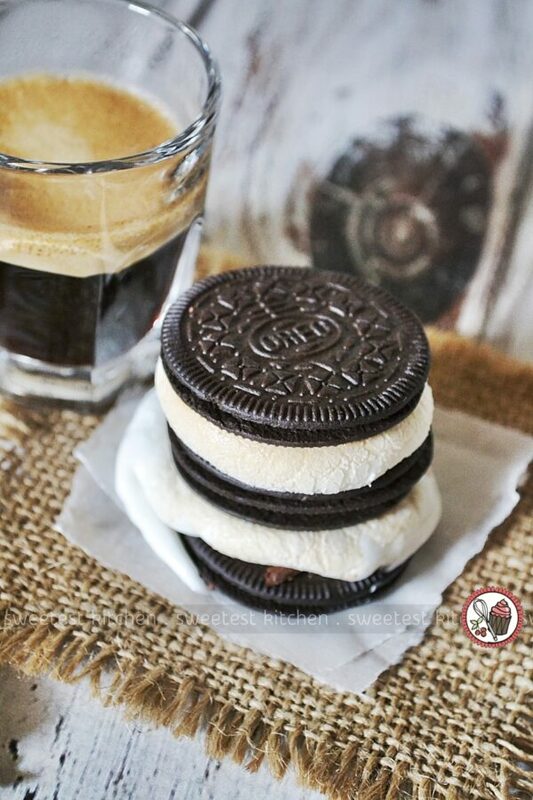 You can use any Oreo cookie in this recipe, and any flavor of chocolate that you prefer.